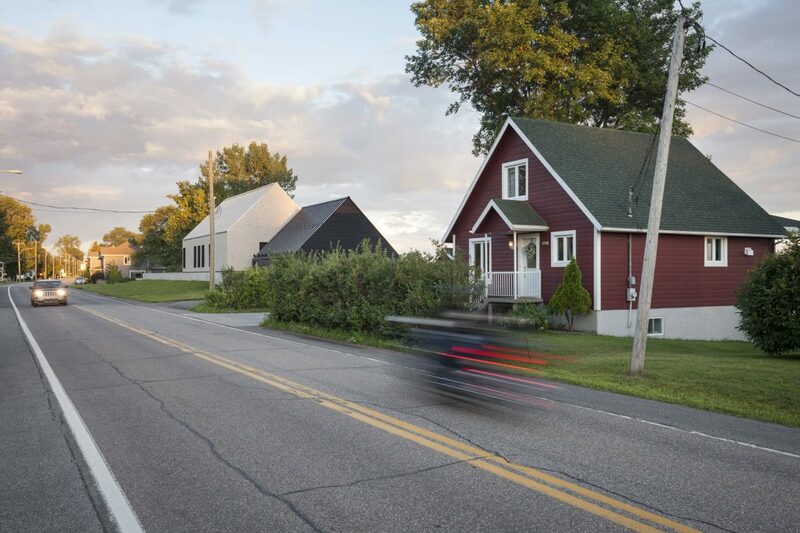 Take a quick glance at this home as you drive along the road following the shoreline of Lac St-Pierre in the Mauricie region. It probably registers as similar to the other homes lining the road. It appears to be two separate 1.5-storey buildings, simple rectangles with pitched roofs. But if you slow down, differences become obvious: the two buildings have monochromatic exteriors, non-obvious main entrances, and far less detail and ornamentation than their neighbours. They look somewhat enigmatic. 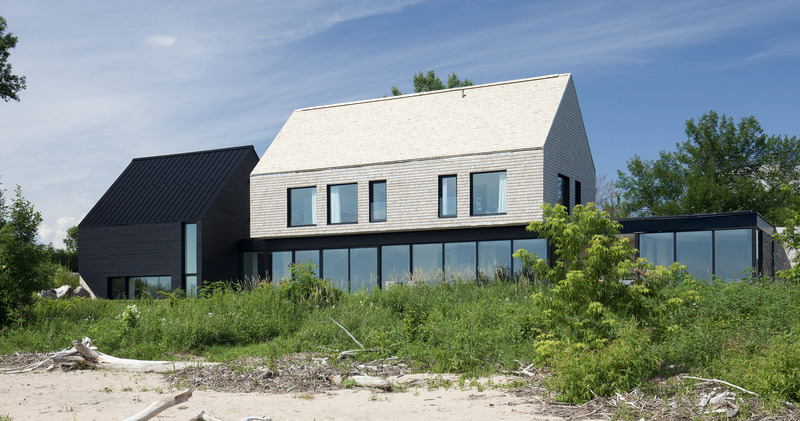 If you approach from the lake, however, you instantly see the home’s true nature, that it’s two connected two-storey volumes – two sections – and much larger than it seems from the road. The look of separation between the two sections is fostered by having no connection between their upper storeys, and their connected lower storeys are barely visible from street level. The home’s main entrance is mostly below street level, accessed by an exterior stairway leading down from the front yard to a vestibule at the same level as the black section’s top floor. 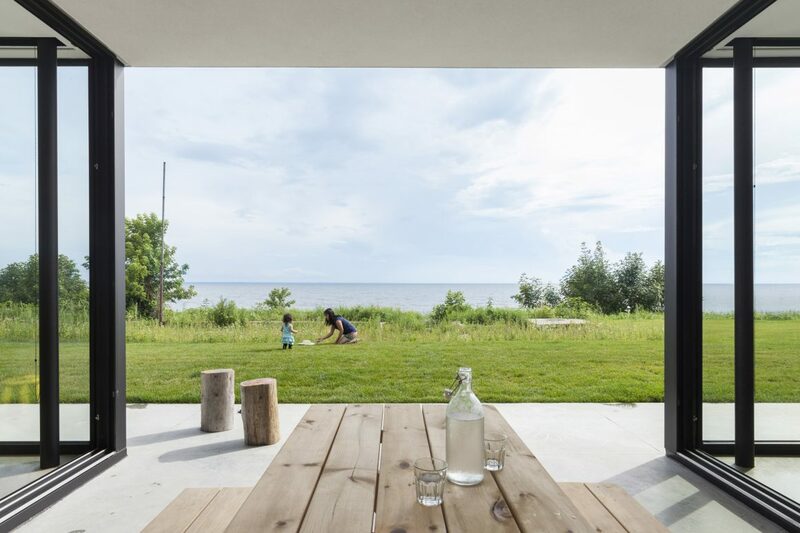 The building is the home of a family of four, and it was designed by la SHED Architecture of Montreal. 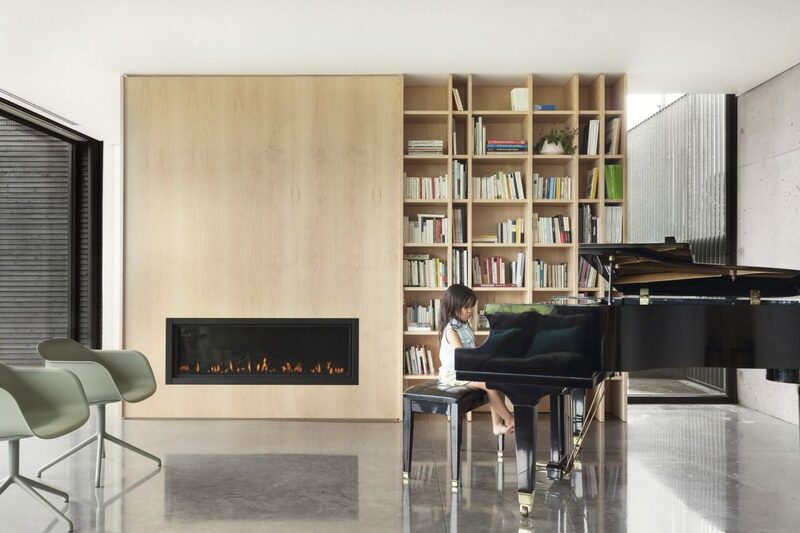 Speaking on behalf of the team at la SHED, architect Renée Mailhot explains that context is nearly everything when it came to designing the envelope of the house. 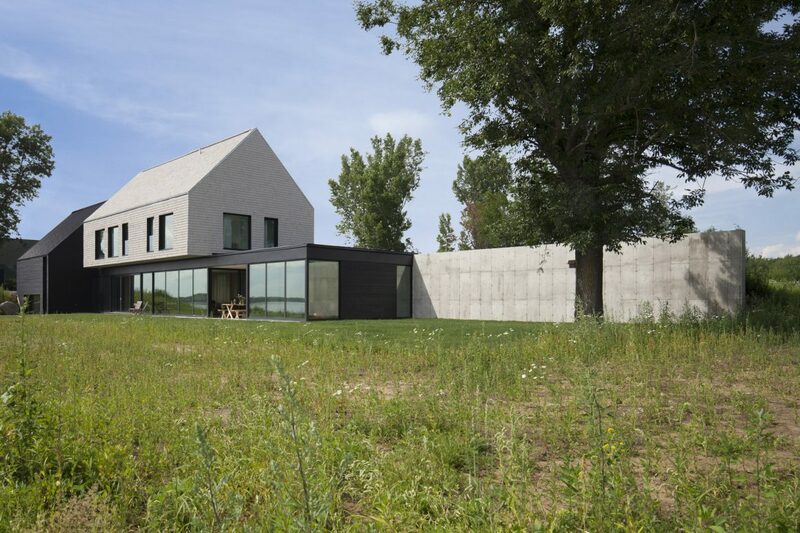 The design of the house was also dictated by the topology of its site. 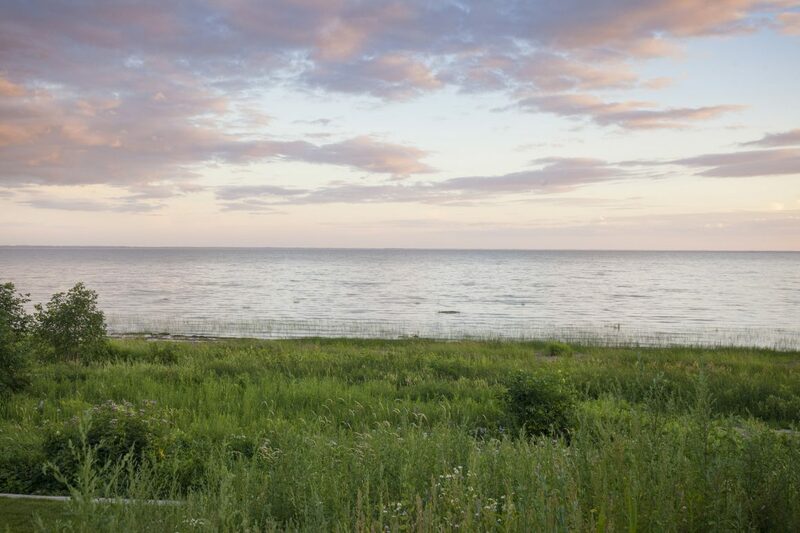 The lot is wide but shallow, between the shore road and the lake. It also slopes towards the lake. “We worked with the slope,” Mailhot says. La SHED built the lower floor of the main volume tucked behind a cement wall running along the street edge of the lot. The lower floor sits mostly below street level and no higher than the top of the wall, hidden within its surroundings so that the pale second storey above it looks like a single storey from the road. The two-storey black section is also deceptive. It sits partway down the slope, looking smaller than it actually is. The home’s two sections provide a total area of 3,900 square feet. 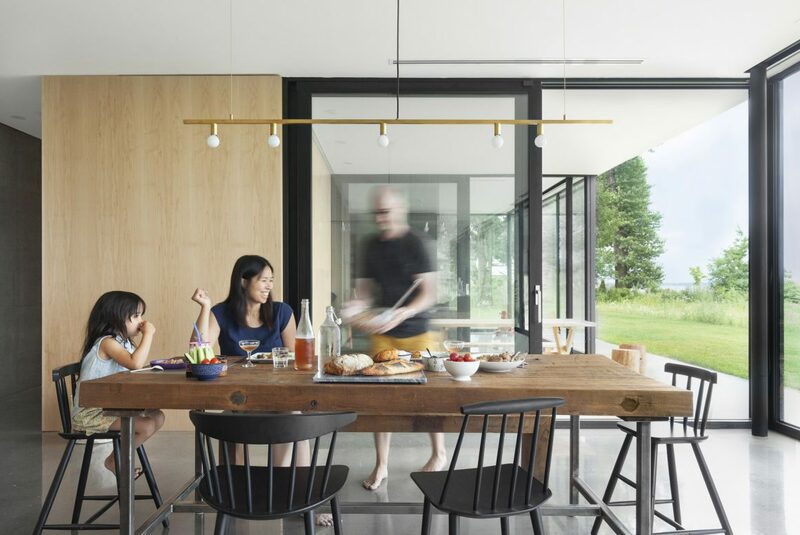 The sightline from the playroom traverses the sheltered patio, with picnic table, and extends to the far end of the dining/kitchen/living space. 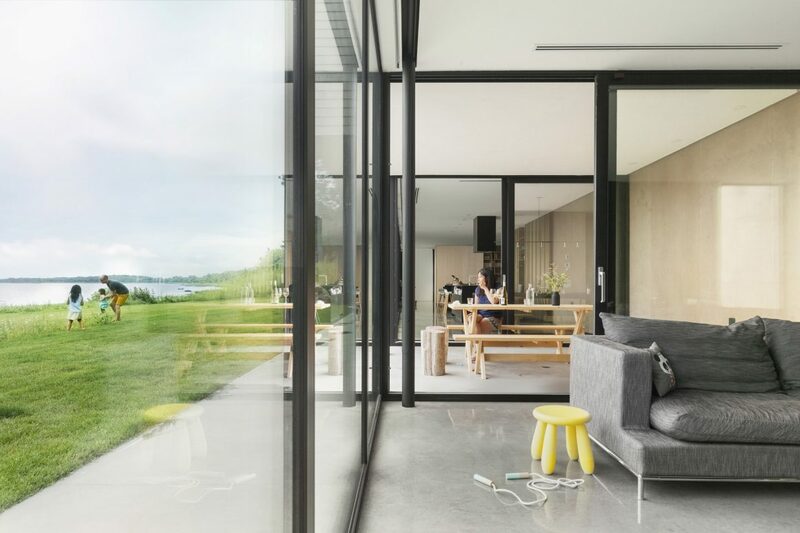 The home’s design is sensitive not only to its context vis-à-vis the surrounding buildings and land but also to the lake view; thus the wall of glass panels running along the lake side of the larger section’s lower storey and the generous fenestration of the second storey. 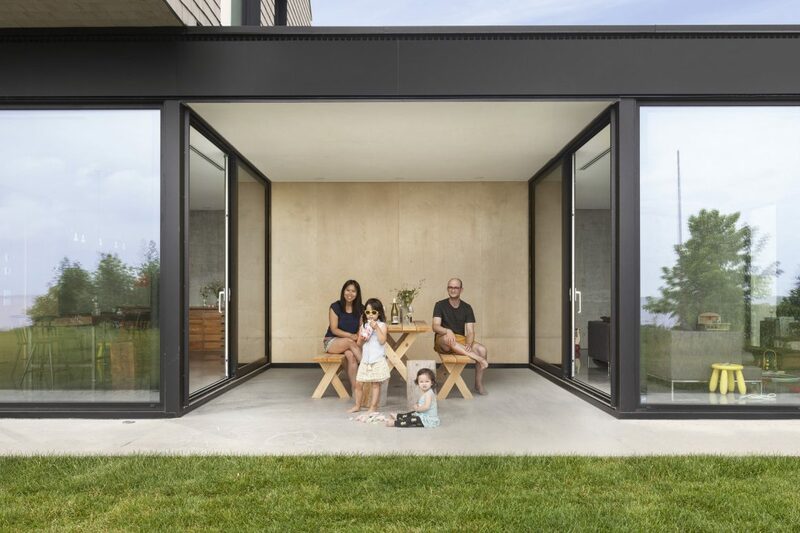 It’s necessary to remember, however, that this is a home, and not simply an exercise in contextual design, and a home must respond to its occupants’ needs. 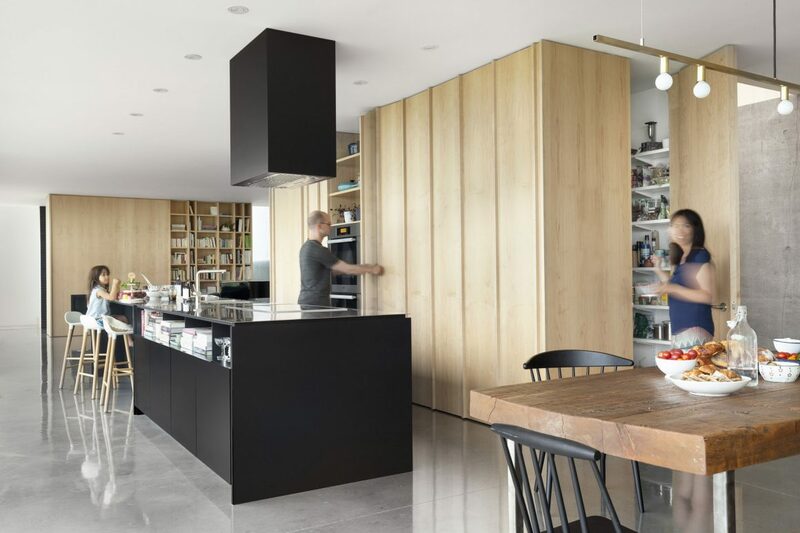 The homeowners had seen other la SHED projects and were inspired by its approach to contemporary style, believing that it could address their concerns about the narrowness of the lot. They wanted their home separated from the street but not closed off. They also asked for plenty of open space, with living areas connected to each other. 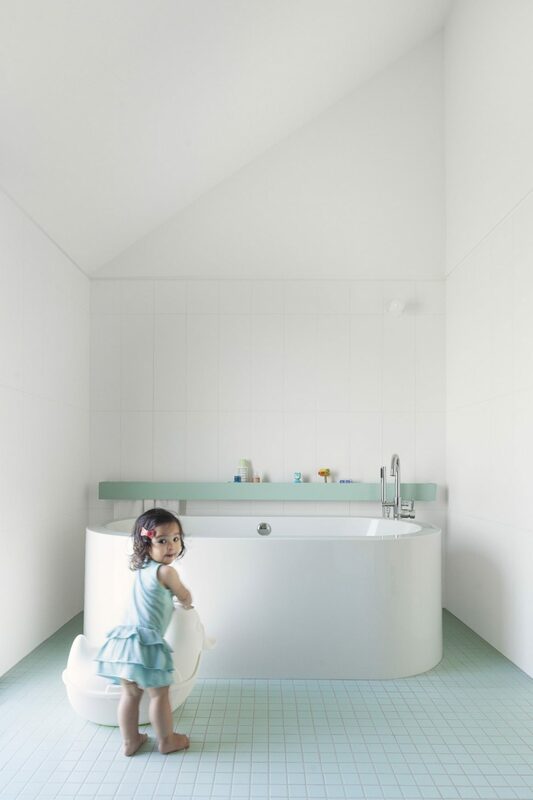 It was important that their two young children have a playroom, and that they be visible from all the common living areas. La SHED placed most of the family spaces in the pale section, with the black section being mostly garage in the top storey, and with office, full bathroom and guest room at ground level. 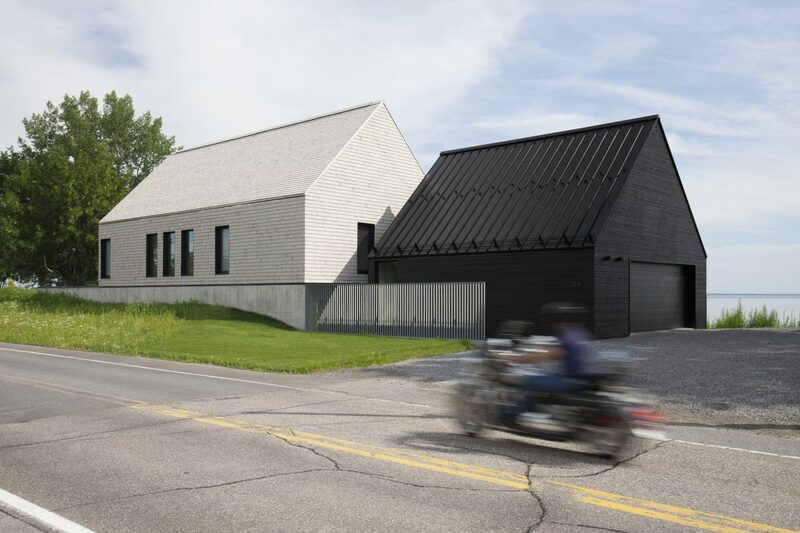 The exterior design is a stylized version of the local architectural vernacular, but the interior is nothing like those of the surrounding Quebecois village houses. 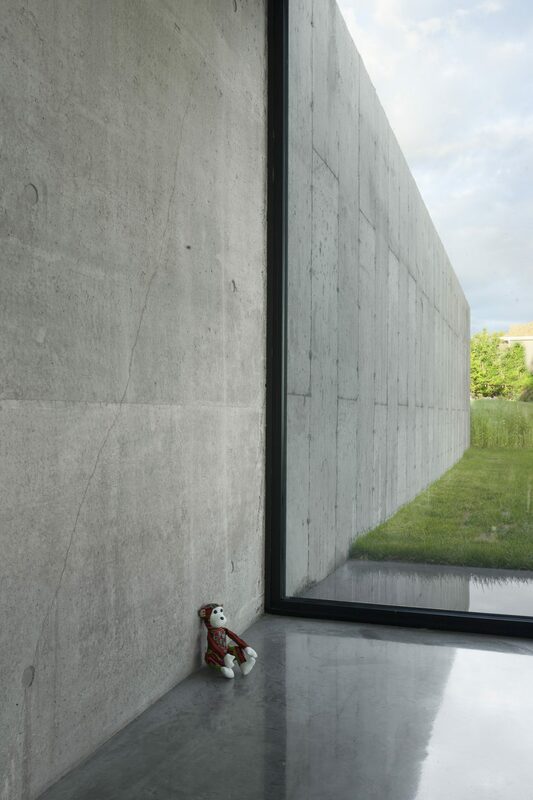 In the pale section (the family living section), the interior of the ground floor is one long space with a blank concrete wall running along the street side and almost exclusively glass on the lake side. Any tendency for it to look like a bowling alley is firmly negated by blocks of closed-in areas in pale natural maple. 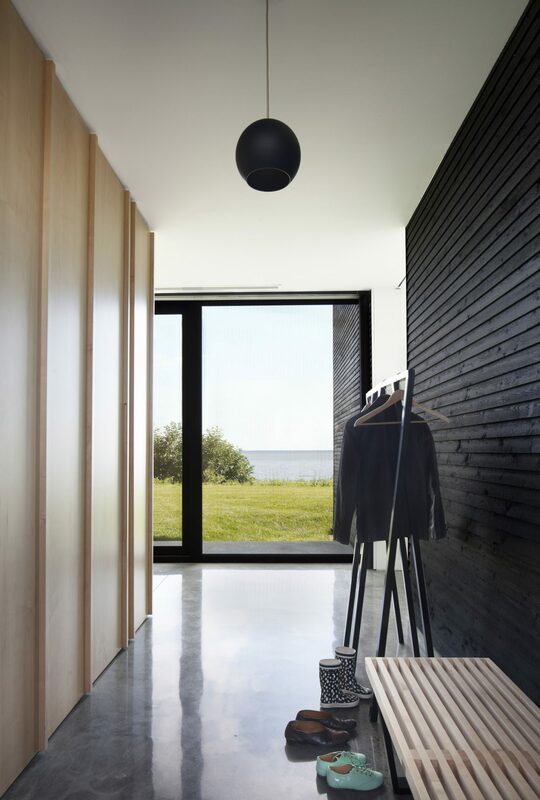 The upper floor as seen from the corridor-like entrance to the master suite, with closets on each side. 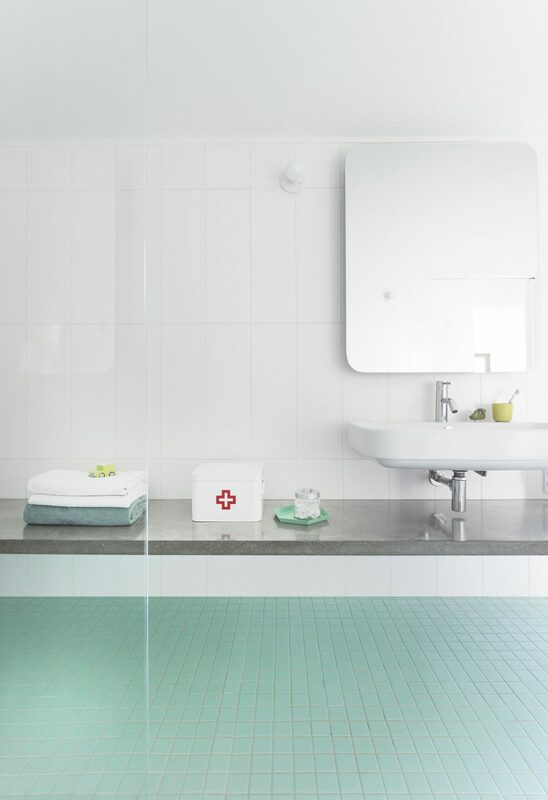 Privacy is provided by a pocket door. 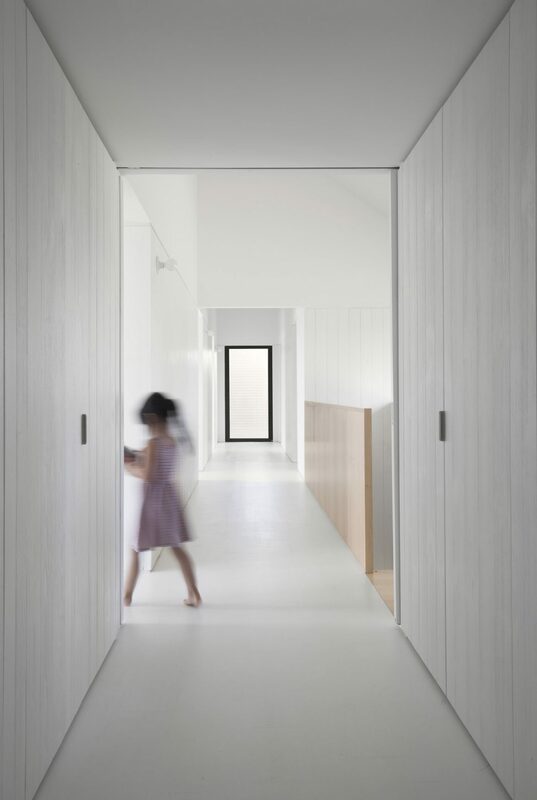 The run of the ground floor is also punctuated by an indented space between the dining end of the living area and the children’s playroom. 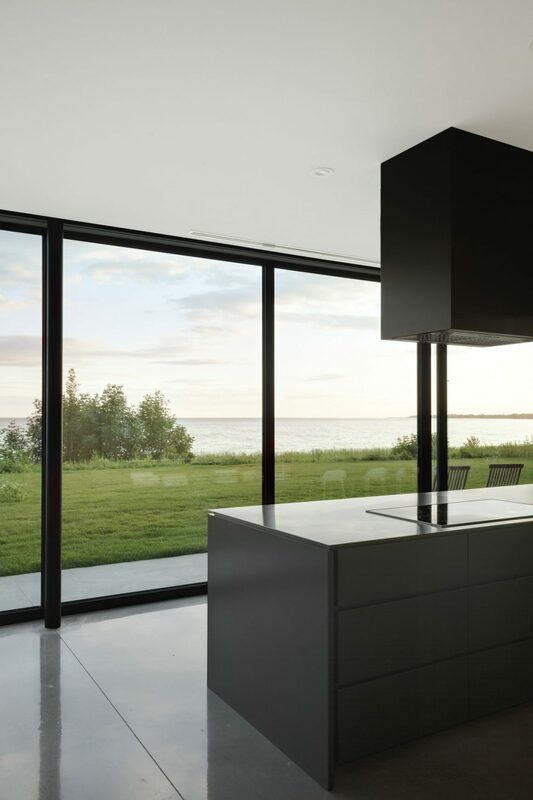 This sheltered patio is open to the elements on the lake side and protected above by the overhanging second storey. Upstairs is more divided. 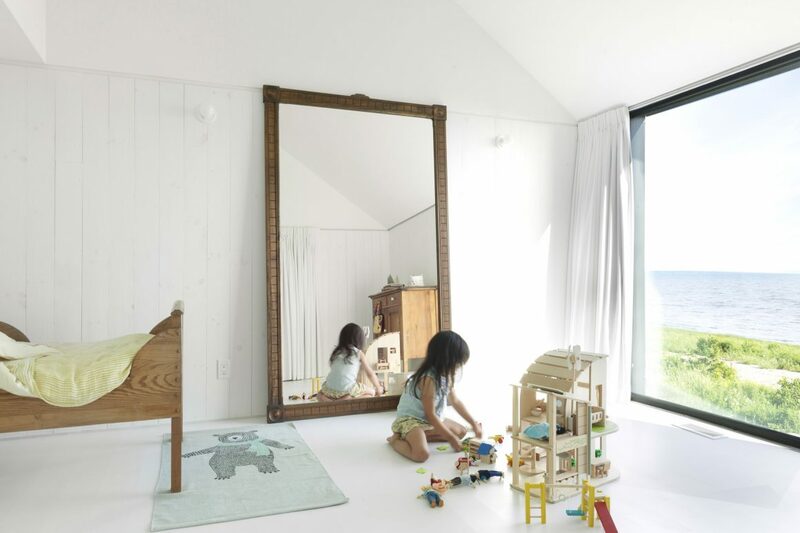 There are separate, more intimate spaces for two children’s bedrooms, a bathroom, and the master bedroom with walk-in closet and ensuite bathroom. 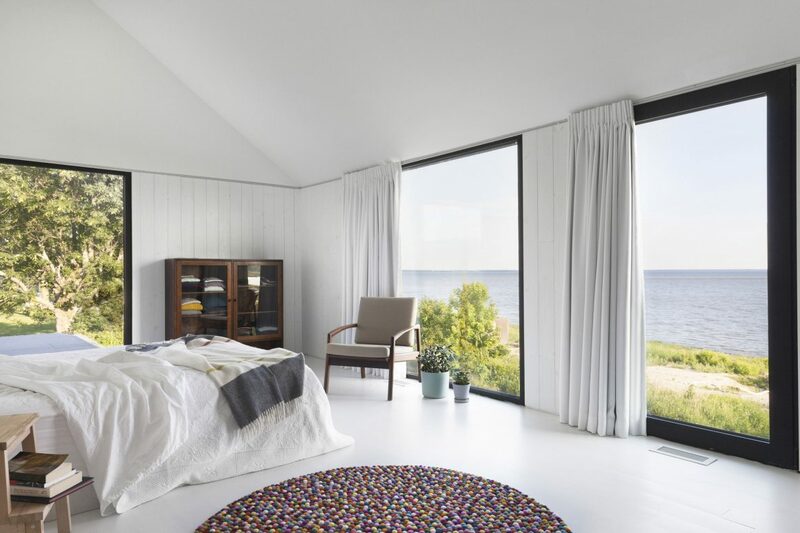 All rooms, including the bedrooms, face the lake with its sweeping views. 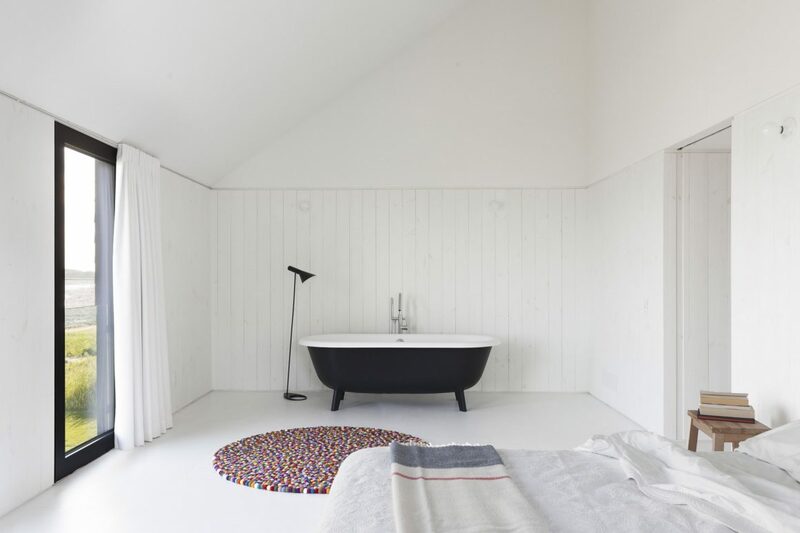 Over-all, the home is minimalist and functional. 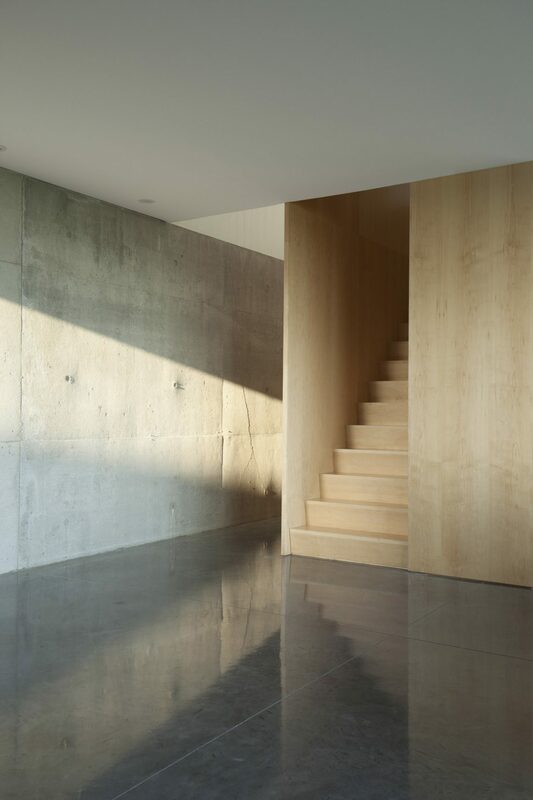 The austerity of a concrete floor and back wall is tempered by the warmth of the maple wood interior structures, the light flooding in, and abundant evidence of a busy family life.